The animal kingdom is a colourful place, but not in the eyes of the Serbian photographer Boza Ivanovic (1972). 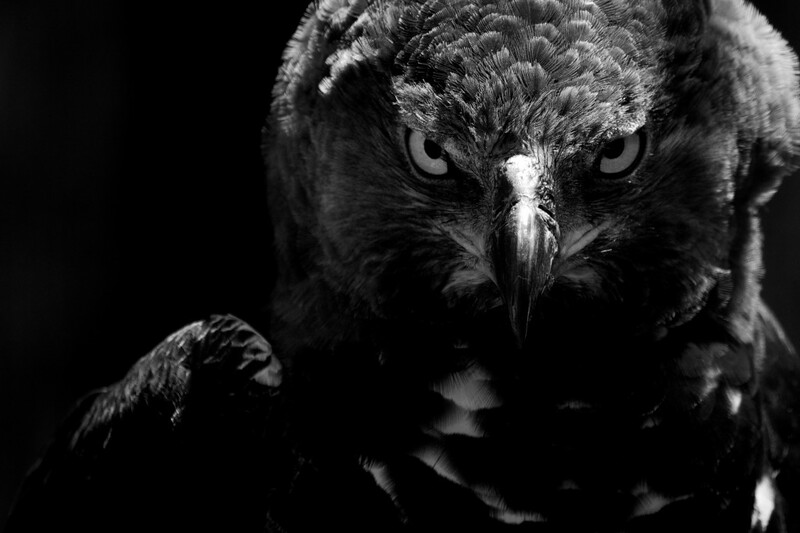 The bright feathers, divergent stripes or striking camouflage is irrelevant; he captures the essence of a creature’s spirit in black and white. 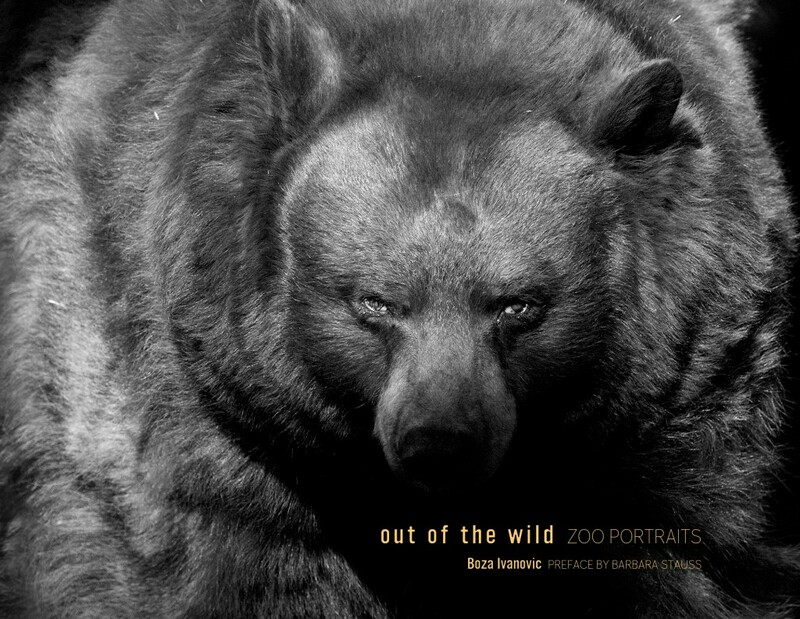 With the captivating photographs in his first book Out of the Wild: Zoo Portraits he pulls the viewer past the protective boundaries of no less than sixty-three zoos in nine countries over the course of nine years, and let’s his subjects appear as they do in nature – without the bars that restrict their freedom. 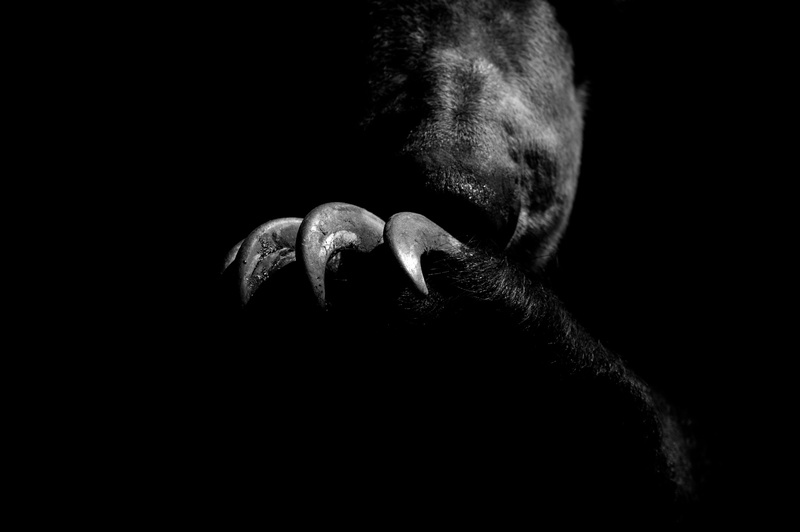 By getting up close and personal with the world’s most voracious predators, Boza captures a sensation of awe and fear in his images, creating a tension that’s felt at first glance: a wolf staring you straight in the eye, the open jaws of an alligator, a jaguar posing as though it could hunt you down any second. 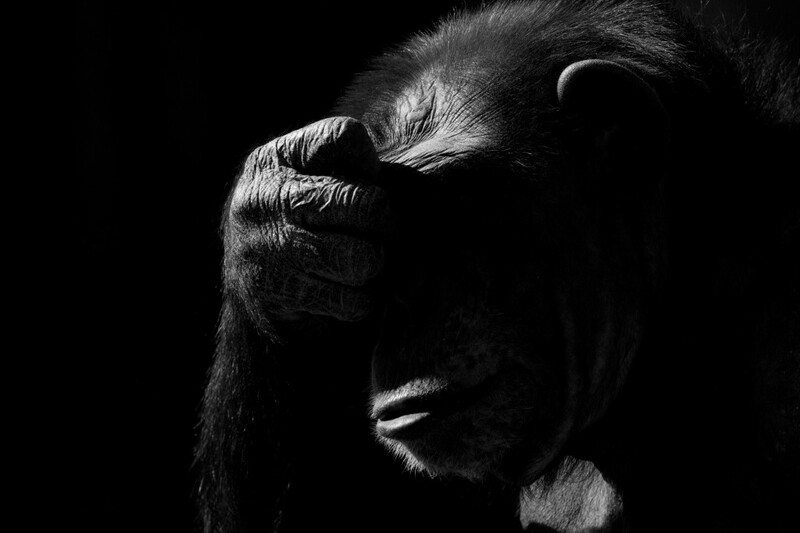 The dynamics of going to the zoo and peacefully gazing at the animals is artfully transformed in these photographs. 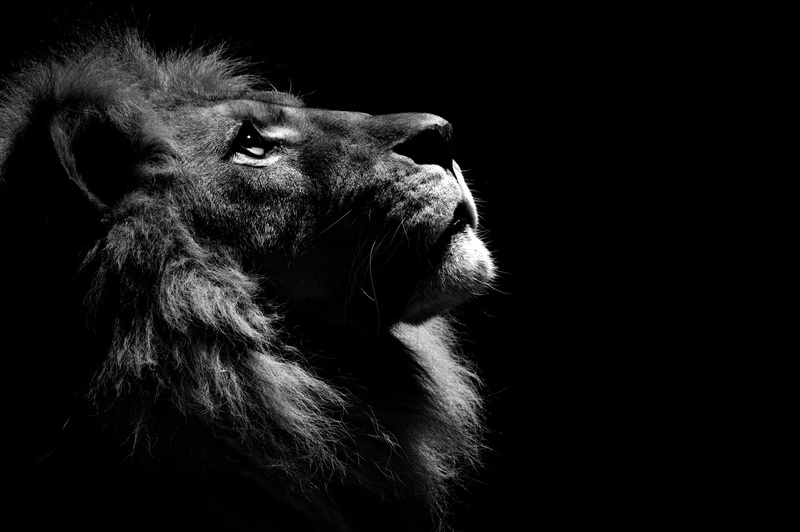 Others, like the one of a contemplating chimpanzee or a lion gazing into the sky, connect you with these animals like no wildlife image ever did before; giving them a humane touch that acts like a window to their soul. There is no background that distracts, no other aspects that could lead your eyes away from the animal. 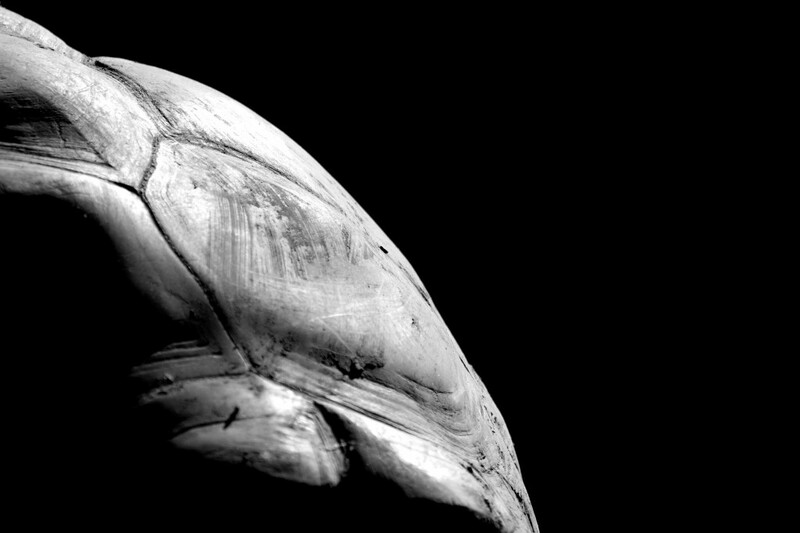 They emerge from the darkness and move gracefully toward the lens, their whole persona or precious detail is captured. The stripes of the Zebra highlighted, the teeth of a Macaca carefully crafted and the claw of a Bear majestically revealed. The animals seem to voluntarily express themselves to Boza’s camera. The Gorilla for example was different. Boza had to be close to the wall and wait for the right moment. But every time he took a picture, the animal turned his back on him. Moving to the other side of the enclosure the ritual repeated itself. Yet, after he turned his back to him the Gorilla would actually look at Boza. It made him realise that this animal actually knew what he was trying to do. “A really scary thing to think about’, he said. “It made me wonder what’s going on in this creature’s head? Does he want to be free?” He found this an emotional experience. Showing the emotions and character of a wild animal is a challenge that few photographers attempt. Boza has been successful by using B&W, creating an image where the animal is centralised, and without the distraction of colour and surroundings. By doing this you focus on their expressions, moods and look at them as an equal. 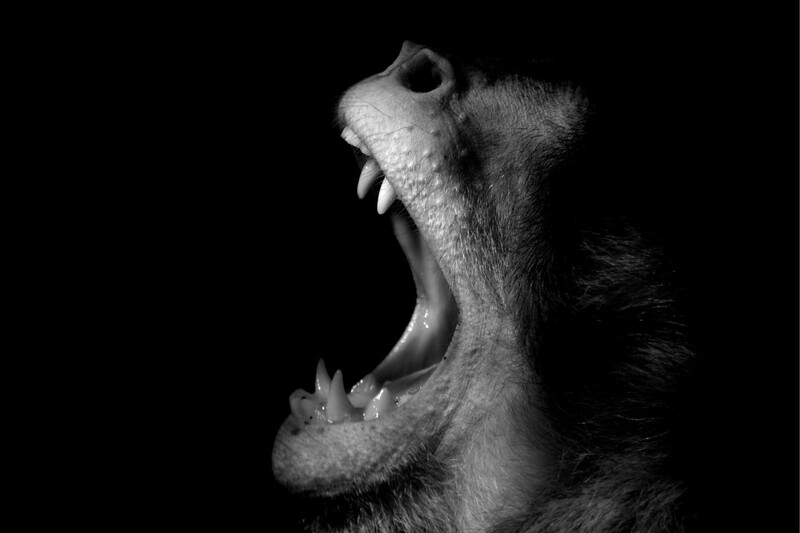 Even the sound that the photographer heard when shooting the image seems to resonate; the animal’s scream or roar is visible. This style of imagery is rare as it connects to the animal kingdom on such a human level. He sees himself as a messenger, not in the biblical sense of the word, but a visual one, in the form of a photographer. Over two and a half years, Jimmy Nelson (b. 1967, United Kingdom) travelled around the world capturing tribal cultures on the brink of transformation due to the technological expansion that soon will reach even the most distant corners of the globe. Nelson saw it as his task to capture the traditional lives of these shrinking communities, bringing the images together in his new book, Before They Pass Away. Carrying a 4×5 field camera to 44 countries, from islands in the South West Pacific Ocean to the Artic Coast, from the Amazon rainforest to the Tibetan mountains, Nelson embarked on a journey of visual anthropology. The 29 different tribes he portrays are still authentic, unspoiled by the effects of globalisation, their lives still dominated by rituals and efforts to survive the harshness of nature. Yet, it’s not exactly those aspects that Nelson has focused on, instead posing them for close-up portraits and group photos on locations that offered the best lighting and backgrounds. He even got two tribesmen in Vanuata to stand on top of a mountain, posing with their bows, waiting for the perfect ray of sunlight. The result is that, although the images show the tribesmen’s deep and passionate knowledge for the nature in which they live, it does not particularly reveal their real lives, but rather, a representation of how their lives look from the perspective of an outsider who has a directorial vision. “I am teaching the developed world what they have lost and enlightening the underdeveloped world what they still have,” Nelson explains about the project. “Most importantly, I wanted to create an ambitious aesthetic photographic document that would stand the test of time. A body of work that would be an irreplaceable ethnographic record of a fast disappearing world.” While it’s impossible to ignore the irony of exposing isolated groups to the full Hollywood-style crew and equipment treatment that Nelson used, and the implicit conflict of interests, the results are beautiful, however biased. A master composer, Nelson managed to get whole tribes to climb into trees, stand atop of a volcano and pose in the freezing cold. Combined with intimate portraits, the resulting 400 images in Before They Pass Away move between macro and micro levels, showing a wide variety of human experiences and cultural expressions. 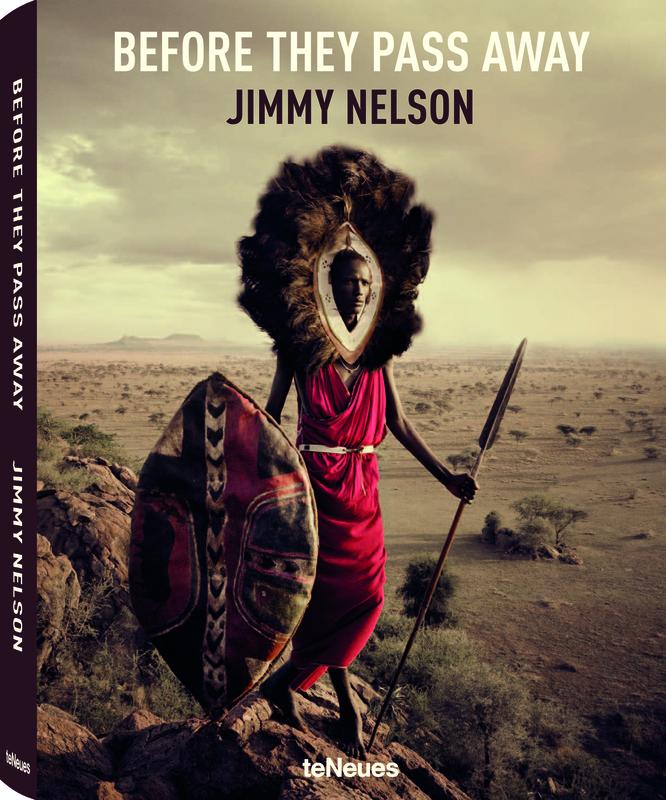 The exoticism of tribes like the Rabari, Mursi and Himba sound so remote, but Nelson manages to bring them much closer. 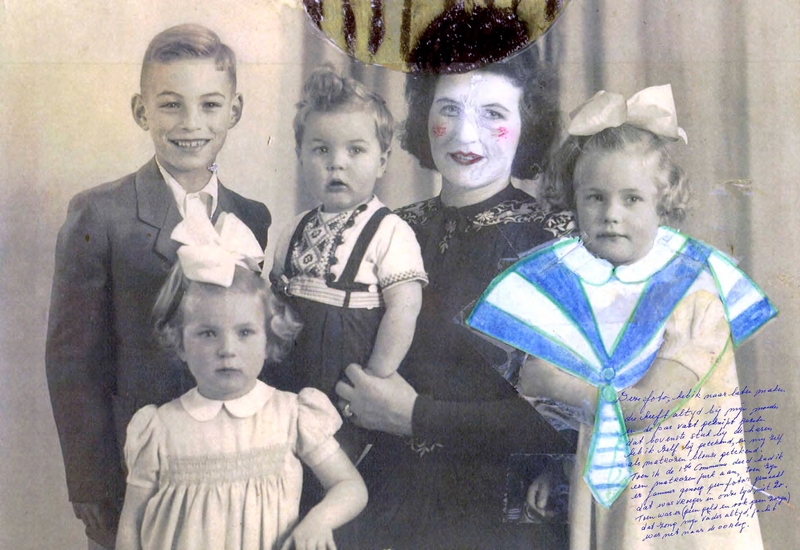 Their costumes and rituals may seem unfamiliar, but Nelson portrays families and family members in a dynamic recognisable even to a Western family. Although Nelson saw it as his task to truthfully document the lives of these people, the photos in actuality are rather glossy and romantic. It seems contradictory that Nelson wanted to portray these ‘untouched’ tribes in their natural habitat, yet completely arranged the setting and his subjects in an unnatural way. All the people are in the perfect place at the right moment, fully dressed up and prepared for the shutter of the photographer. Warriors walking through the bush, an elderly man standing on top of a holy mountain or a woman sitting in a desolated desert: he staged it all. Yet the benefit to this is that much can be seen in the photographs. Nelson succeeds in showing us the tribes in their full glory: the richness of their individual cultures, the strength of their solidarity and independence. While the rest of the Western world already knows Richard Avedon (1923-2004) as a revered 20th-century photographer, he’s not that famous in Australia. The National Portrait Gallery in Canberra therefore has set out to offer audiences the first broad-ranging exhibition of Avedon’s work in the southern hemisphere. Considering that The New York Times proclaimed in Avedon’s obituary that “his fashion and portrait photographs helped define America’s image of style, beauty and culture for the last half-century” and Le Monde described him as “the most lucid observer of our society”, there’s only one thing to say: it’s about time. Avedon is perhaps most readily known for his fashion photography, and it’s true that he produced iconic fashion photographs that defined his time. Canberra’s new exhibition, entitled People, rightfully explores that aspect, but of course there is more behind the man that shot celebrities like Brigitte Bardot, Jacques Cousteau, Andy Warhol, Marilyn Monroe and the Dalai Lama. The focus turns instead to his groundbreaking portraiture. He might have started out shooting for Harper’s Bazaar and Vogue, but this was right after he photographed thousands of American sailors during World War II, working as a photographer for the Merchant Marine. At the core of his artistic work was a profound concern for the emotional and social freedom of the individual in society. This concern is exposed the most in his portraits that, with their clarity and boldness, emphasise the reality of his subjects’ lives, combined with an ever-present sense of motion. “My photographs don’t go below the surface. They don’t go below anything. They’re readings of what’s on the surface. I have great faith in surfaces. A good one is full of clues”, he wrote in 1970. To investigate those surfaces, he documented street life in New York City with his Rolleiflex on commission by Life Magazine, shortly after World War II. After nine months of shooting however, he reconsidered, returning his advance and holding back the images. These were eventually published in 1992, in his book An Autobiography. Chris Chapman, the curator of the People exhibition, decided to include these images in the display, after two and a half years of deliberating with the Richard Avedon Foundation in New York, the city where the photographer spent most of his time. The eighty works that are on display at the National Gallery include shots of hard working farmers, inmates of a mental hospital in the ‘60s (published in his book Nothing Personal, in collaboration with writer James Baldwin and designer Marvin Israel, 1964) and of course plenty of his revealing portraits of the last century’s luminaries – including a two meter tall shot of choreographer Merce Cunningham. Six decades worth of career as a fashion, portrait and documentary photographer captured in one exhibition, “to illustrate his strikingly diverse aspects and to bring out what is at stake for him as an artist, as a photographer, his absolute concern for creative freedom, the creative rights of the individual society”, according to Chapman. While with his celebrity photographs he resisted idealisation, desiring to reveal the humanity of revered individuals, in his fashion photography, he demanded that the models convey emotions – a departure from the norm at the time. Chapman said in an interview that one of the main innovations in Avedon’s style was to take models out of the studio and into the streets, explaining that they “give his work from that period a fantastic sense of dynamism and flair”. Yet, with his portraits, whether of the famous or the unknown, he isolates his sitter against a plain white background to extract them from their surroundings, placing them face to face with the viewer. Adorned only with the intact black edges of his film, the purist’s mark of authenticity, the style of these images defined the Avedonian portrait. The results raw, intimate and powerful. In his home country of the United States, Avedon is one of most widely exhibited photographers, from Washington’s Smithsonian Institution to New York’s Metropolitan and Whitney museums. And, as perfectionistic as he was, museums exhibiting his work must conform to his rules. For example: the images that exist solely as negatives cannot be turned into exhibition prints. No wonder Chapman had to travel to New York several times to discuss his choices with the foundation. Luckily, there is no shortage of exquisite images to display. The exhibition Richard Avedon: People is on display at the National Portrait Gallery in Canberra, Australia until November 24, 2013. After which it will tour to the Art Gallery of Western Australia and Melbourne’s Monash Gallery of Art next year. A new photobook from Anton Corbijn (1955) is always a good reason for a lot of media attention and a grand presentation. Earlier this year it was time for a moment like that again, this time for Waits/Corbijn ’77-’11, a combination between the work of the rockstar amongst Dutch photographers and the musical star Tom Waits. The amount of artists that Corbijn shot is almost uncountable, but the chosen ones which he actually dedicates a book to are scares. Starting with Depeche Mode of course, followed by the German singer Herbert Grönemeyer, the unforgettable work he did with U2 and not to forget the Dutch rock & roll junkie Herman Brood. And now there is the book about Waits, whom he met in 1977. 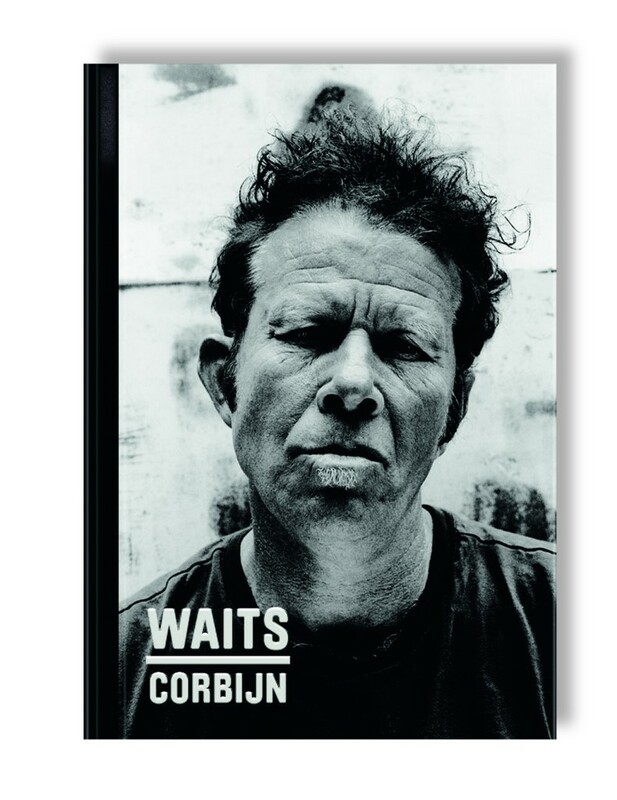 Almost 35 years of friendship are covered in Waits/Corbijn ’77-’11, resulting in a photobook with 226 image; each a witness of a very fruitfull collaboration for both careers. Unfortunately the book is only available in a limited edition of 6.600 pieces for quite a steep price which can only be expected to rise ones this exclusive publication is sold out. Exclusivity is something that was to be expected from Corbijn: the book is bonded stylishly in linen and simply look stunning. Even though most of the images consist of portraits of the eccentric Waits a quarter of the book is kept free for pictures from his own hand. A nice gesture from Corbijn, but for those snapshots you obviously don’t pay good money. Even though they will help to understand the person Waits better, according to Corbijn, the singer should stick to making music. The intimate pictures the better photographers shot however, are pure world class. ‘Believe me, I don’t jump of a rock with a Dracula cape for anybody’, says Waits, a quote that says everything about their friendship that already lasts over three decades. That relationship is visible on every raw, grainy, artistic or confronting image. Black and white is the composition that suits Waits and Corbijn best and next to just a few color images these form the overtone. Dark and harsh, that’s it, but because it concerns two friends you also find a hit of humor that they must have experienced when shooting. Waits couldn’t have asked for a better chronicler of his life than Corbijn. 108 pp, hardback with jacket, 75 illustrations, 70 in colour, 29 x 25 cm. It couldn’t have been an easy trip for Jim Naughten (1969), traveling thousands of kilometers through the Namibian desert and constantly having to clean his camera from all the dust and sand. Still, it was the only way to meet and portray as many members of the Herero tribe in the South African country. He needed to tell them what he was planning on doing and that took a lot of preparation, effort and perseverance. The British photographers wanted to capture the tribe members in their flamboyant and colored costumes, which however stem from a troubled past. 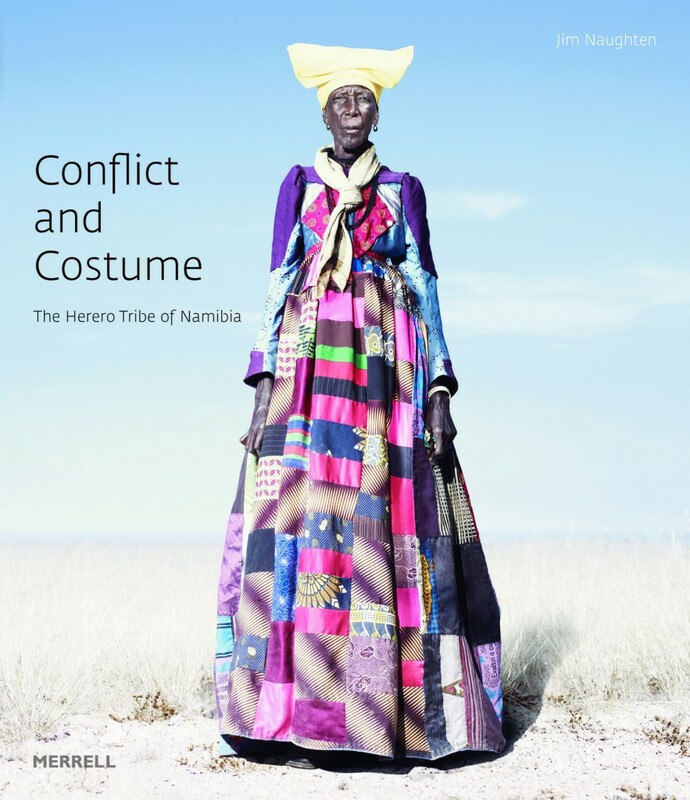 In four months Naughten produced his broad work for Conflict and Costume, The Herero Tribe of Namibia with the searing heat of the intens Namibian desert as backdrop for marvelous portraits of it’s proud inhabitants. Fully dressed up. Meaning men in paramilitairy uniforms or all suited up, woman in exuberant dresses in Victorian style, all with a hint of Africa and powerful, full of self confidence captured. When you realise that some of these gears take up to ten meters of fabric and the temperature reaches fifty degress Celsius, you understand that posing must have been quite a challenge. Naughten got invited to weddings, funerals and other ceremonies which proved the perfect occasions to catch the decked Herero’s and portray them in the magnificant Namibian landscape. Some appear suddenly and just fitted perfectly in the light settings, while for others extensive negotiation with the village elders was required. Respect, honour and pride are therefore important aspects of his work and everything in Conflict and Costume represents that. The low view point is one of the things that make that visible. 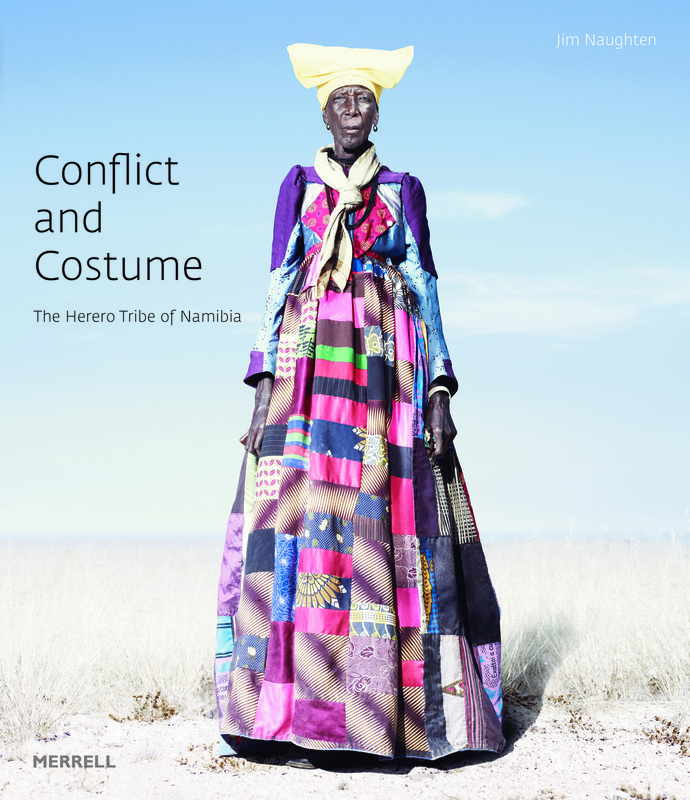 Fifteen years ago – back then on a motorcycle – Naughten traveled through the country and got fascinated with the clothing style of the Herero’s. Now there is this phenomenal book with monumental images. Luckily, finally. 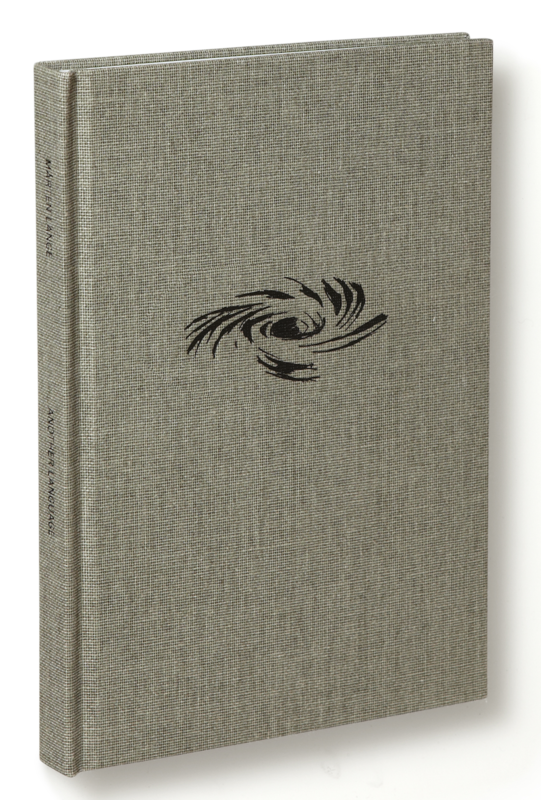 96 pp, embossed hardcover, 59 tritone plates, 14 x 21 cm. The aesthetics of science and nature are recurring themes in the work of Mårten Lange (1984) and his fascination shows again in his latest book Another Language. In his previous four books we saw a particular lot of trees, branches, machines or shots of unexpected events pass through the pages. Ever in his signature abstract form. It’s no surprise therefore that he opens his new work with a quote from the German naturalist Alexander von Humboldt, who declares that ‘the physical boundaries of nature end at a point where the intellect starts and there opens a new world for the mind.‘ And let that be precisely what Lange had perceived and in which he succeeds with his first big overview in which just nature holds a central position. He combines flora, fauna and natural occurrences like eddy currents to intimate still lifes in which he changes off landscapes which images of batts, fishes or a pumpkin. The subtle storyline – the minuscule black and white photographs are fit with text nor caption – presents itself by slowly exfoliate through the small, thin book. You will discover that his story starts with a meteorite crater, followed by several masses of land and ends with an image of a plant far away. Though this is not what the Swedish photographer actually want to show, for him it’s more important to explain the consistency of nature and the cryptic clues that these behold. By using returning shapes, patterns and textures he want the break the simplicity within the image and mirror that against an enigmatic whole. The artistic images that are always presented in a centered way seem to be uninformative at times, just like the subjects can be vague and unclear. But it’s the complete picture that forms the key to his work. Hence the alternations between the elusive – lightning, the stars – and that what is so everyday and common, like ducks and stones. 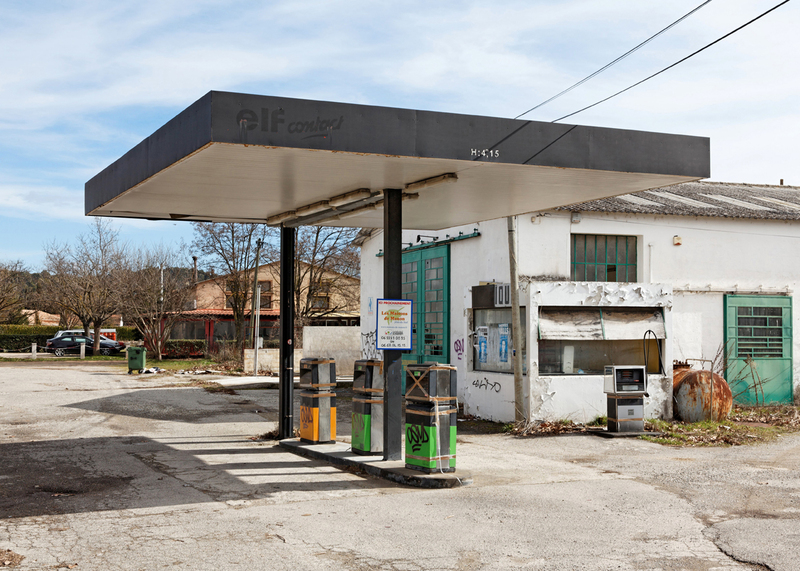 These subjects Lange pulls apart from their background and isolates them. He spend one and a half years working on Another Language and of the hundreds of images he shot only 59 made it into the book. Though most of the situation just happened by pure coincidence, he did have a list of subjects which he wanted to portray. With that list he set of, like a gatherer. Notwithstanding the fact that he didn’t find everything he was looking for, he is happy with the result. And so are the critics. Put the American photographer Alex MacLean (1947) in a small airplane with his camera and you know that only marvelous images can be the result. Whether it be landscapes, cities or natural phenomenons, Maclean seems to capture them all with ease. Time and time again he finds that subject which appeals to him and knows how to portray this in his megalomanic fashion. Next to primarily American landscape he focused specifically on just a city before: with Las Vegas and Venice. For his latest release Up on the Roof he again decided to take it from a higher viewpoint, but exchanged his aircraft for a helicopter. Probably worked a lot easier when swirling above the Big Apple, because he focussed all his attention on the roofs of the building in New York. Apartments, companies and skyscrapers; no building was to high for MacLean to not see what was happening on top of it. A roof terrace has always been a luxury in this ever busy city, one of which only the happy few can dream. For the normal New Yorker therefore always raises the question: ‘What’s up there?’ MacLean give us in his latest release an answer to this question, because even though the gates at street level remained closed for him as well he was unstoppable from the sky. In total he captured 183 roof terraces, some of which were transformed to lush gardens (like the miniature forest of singer Bette Midler’s huge apartment in the Upper East Side), personal training facilities or even landing strips, like at 77 Water Street, where a model of a British fighter plane from the First World War can be found. Unimaginable that on top of most of these building, next to the famous water tanks, playgrounds, of course a lot of pools and even messages for extraterrestrial life have been created. A world on top of another. All of this makes the book full of surprises, almost like a revelation. While most inhabitants didn’t seem to be hime when MacLean passed over their private Garden of Eden’s – or simply didn’t care he was intruding on their privacy from this unorthodox position – other wave at him or hold up their beer. Let there be no doubt about the fact that the roof terraces of New York are actually just as busy as the street many levels below. Some of the building are highlighted, while the photographer in Chelsea captured whole blocks at ones. This way we also get a good overview of how these roofs are being used, which form an astonishing one third of unreachable spaces in Manhattan. Next to that Up on the Roof gives us a good image of the geometric city planning for which New York is so famous. 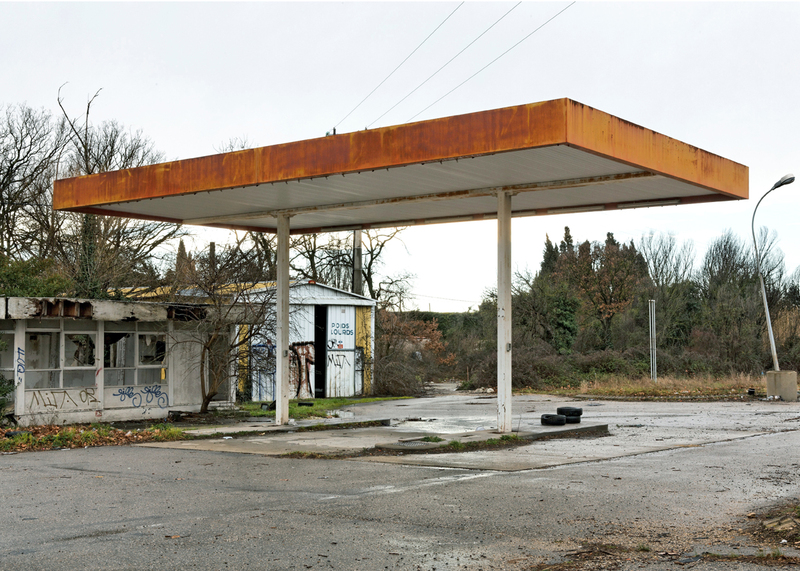 Of all the images MacLean makes notice of the location in the book as well, so when you visit the city that never sleeps next time you can try to find them all. From the street that is. Tijdens je zomervakantie een fotofestival bezoeken is geen straf. Zeker niet als dat fotofestival zich in het idyllische Franse stadje Arles bevindt. Zoals de stier op de poster verklapt is het thema van dit jaar Mexico, terwijl de nadruk van het jaarlijkse festival deze keer ligt op het gebruik van internet. Wellicht niet ieders smaak, maar dermate interessant dat het iedere fotograaf er in ieder geval wat van op kan steken. 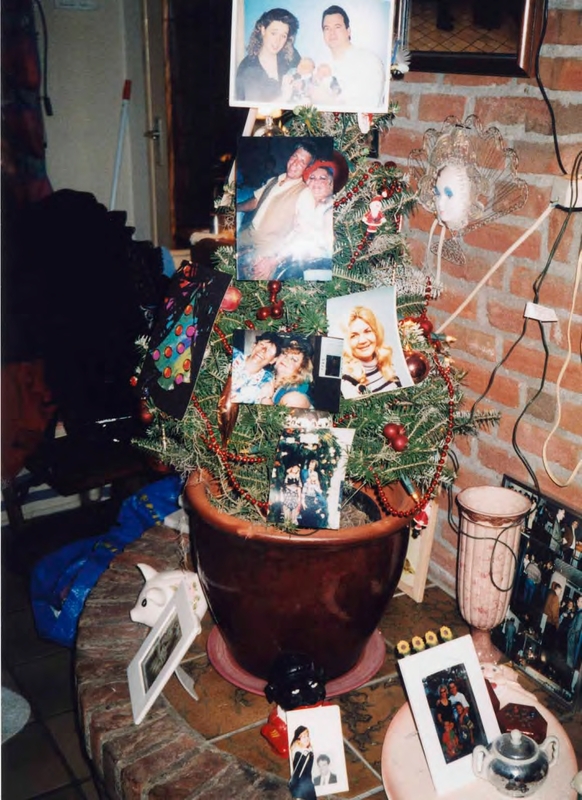 Een stad die tweeënhalve maand volledig in het teken staat van fotografie, zo is Arles het best te beschrijven. Tijdens het Les Rencontres D’Arles Photographie is er geen eeuwenoud klooster, kerk of andere historische plek te vinden waar geen foto’s hangen. De looproute van het festival beslaat vrijwel de gehele binnenstad en dan hebben we het nog niets een gehad over het immense Parc des Ateliers, waar de grote tentoonstellingen te vinden zijn. Een stuk minder sfeervol, zo’n oude treinremise, maar daar bevindt zich dan ook het vernieuwende gedeelte van het festival. Eerst maar even een bezoekje aan het centrum van de stad waar Vincent van Gogh drie jaar van zijn leven doorbracht. In Arles heb je een aantal keuzes hoe je de tentoonstellingen wilt bekijken. 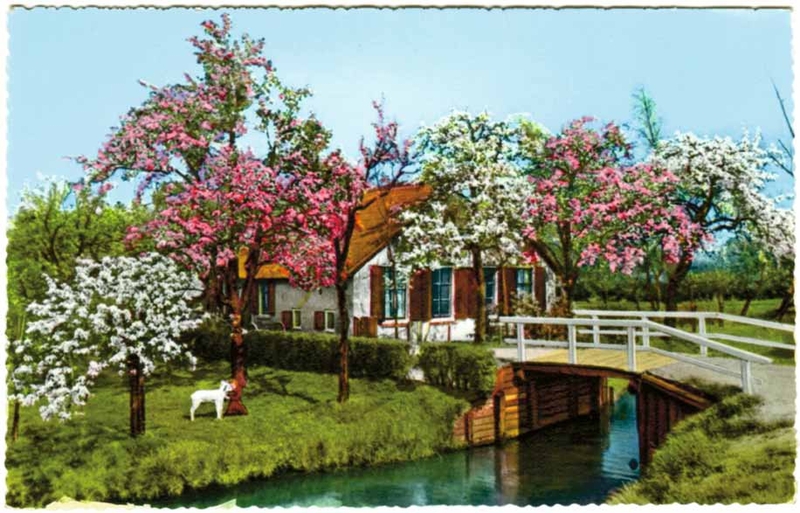 Je kan natuurlijk een keus maken en overal los voor betalen, maar dan wordt het wel een puzzelwerk. Veel beter is het aanschaffen van een dagkaart. Je kan ook kiezen voor een weekkaart, maar het gros van de bezoekers – het grote publiek – zal aan één dag genoeg hebben om zowel de hoogtepunten als een aantal kleinere tentoonstellingen op een relaxte manier te bekijken. Alleen de echte specialisten zullen blijven hangen en alles uit willen pluizen. Terecht: het door Unesco tot werelderfgoed benoemde Arles is sowieso een aantrekkelijke stad en het perfecte decor voor een dergelijk festival, dus wat langer blijven hangen is volkomen begrijpelijk. Binnen het thema Mexico vallen negen tentoonstelling, plus eentje van de buitencategorie die later aan bod komt. Zo hangen in het klooster van Saint Trophime – een schitterende locatie – tien beelden waarmee de Mexicaanse fotograaf Fernando Montiel Klint religieuze boodschappen uitbeeldt. Hij gebruikt hiervoor overdreven veel kunstlicht, waardoor de in scene gezette beelden hun connectie met religie bijna verliezen. 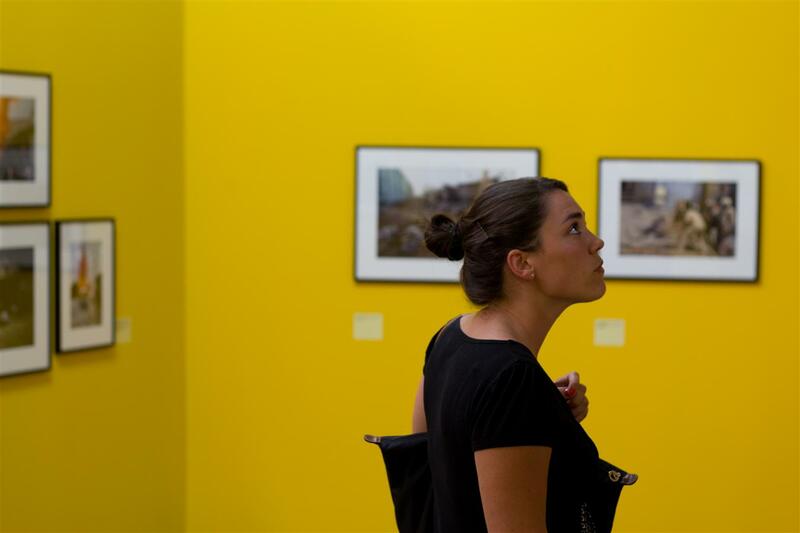 Een wereld van verschil met de tentoonstelling ‘101 Tragedies’ van de eveneens Mexicaanse Enrique Metinides. Van zijn hand komen enkel keiharde, rauwe beelden van ongelukken, misdaden, zelfmoorden en ander onheil. Niet voor de zwakke maag, maar uiterst bewonderenswaardig. Als er iemand op het juiste moment op de juiste plek was gedurende zijn dertig jaar durende loopbaan, dan was het deze man wel. Misère vastgelegd in gruwelijke beelden, voorzien van gortdroog commentaar van de maker. Wederom een andere kant van fotografie in Mexico wordt belicht in het Espace van Gogh. Daar draait alles om de revolutie die aan het begin van de twintigste eeuw in het land plaatsvond. Aan de hand van verschillende fotografen – waaronder veel oud, maar ongedateerd werk – wordt een volledige geschiedenis van deze wereldschokkende revolutie gevormd. Ondanks de leeftijd van de foto’s zijn deze prachtig scherp en missen ze geen enkel detail. Als eerste in zijn soort vormt de tentoonstelling een iconisch overzicht van een van de belangrijkste periodes uit de Mexicaanse geschiedenis. Wat ons direct brengt op de ‘Mexico-tentoonstelling’ van de buitencategorie, te vinden in het prachtige Musee Départemental de L ‘Arles Antique, net buiten het centrum: Robert Capa’s Mexican Suitcase. De ‘verloren’ koffers van één van de grootste namen uit de fotografie vormen een erg indrukwekkende voorstelling en een klassiek overzicht van een oorlog (de Mexicaanse burgeroorlog) die door geen ander zo goed in beeld is gebracht. Wederom iconische beelden, waarvan het een wonder dat ze zolang verborgen zijn gebleven. Het is daarnaast moeilijk voor te stellen dat al dit werk uit slechts twee koffers komt. 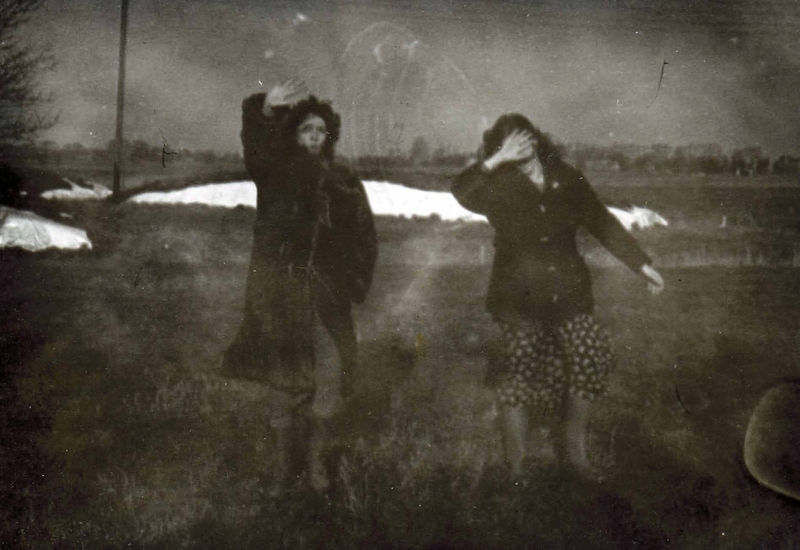 Naast uitvergrote contactsheets bevat de tentoonstelling ook veel beelden van het prachtige ‘stelletje’ Capa en Gerda Taro en mooie portretten van een hun partner Chim (David Seymour). 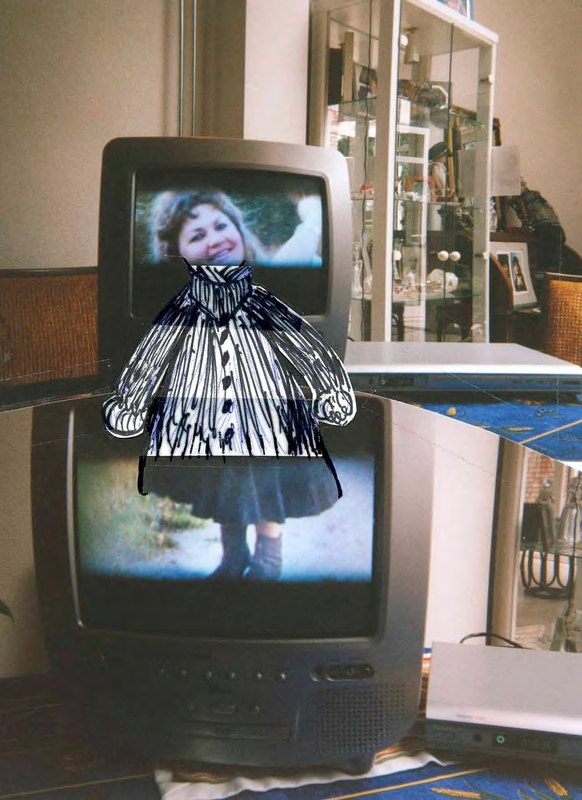 De tentoonstelling biedt een goede afwisseling tussen de contactsheets en vergrote afbeeldingen, zodat er een mooi contrast ontstaat. Dat het een van de meest populaire tentoonstelling is lijkt niet verwonderlijk: het is de eerste keer – na New York – dat de exhibitie in Europa te zien is. Van de ene uithoek van de stad is het zowaar het meest logische de andere uithoek te bezoeken: het Parc des Ateliers. Deze biedt namelijk plaats aan een andere hoofdtentoonstelling: het spraakmakende From Here On. In een grote ruimte, industriële ruimte zijn daar veel experimentele fotografieprojecten samengevoegd, allemaal samengesteld uit beelden van het internet. Of het nog fotografie is als je op zoek gaat naar mannelijk geslachtsdelen en deze verzamelt, of Google’s Streetview afspeurt op zoek naar straatprostituees is de vraag, maar het zal iedere fotograaf in ieder geval aan het denken zetten. Het is een manifest, ondertekend door de vijf curatoren van het festival en ondersteunt door maarliefst 36 verschillende fotografen (waaronder een groot aantal Nederlanders). Ondanks het Mexicaanse thema is het toch de gedachte aan deze ‘geplukte’ beelden die het meest bijblijft. Vernieuwing vormt, zeker gezien het formaat, de boventoon in Arles dit jaar, waarbij internet een immens grote rol speelt. Dezelfde kentering is te zien in de aangrenzende Grande Halle, waar de winnaars van de Point of View 2011 Discovery Award hangen. Onder het opkomende talent zitten zoals ieder jaar zowel uitblinkers als tegenvallers, met het werk van de Zwiters-Kameroense duo Jean-Luc Cramatte en Jacob Nzudie met ‘Supermarket’ als uitblinker aan de ene kant en de Amerikaanse Penelope Umbrico aan de andere kant. Originaliteit tegenover banaliteit, waarbij voor de laatste het internet wederom als grote inspiratiebron diende. Het talent van dit jaar is eveneens erg breed en experimenteel bezig geweest, met een breed scala aan interessante onderwerpen. Is de uitwerking van een reis langs de Amerikaanse westkust van de Amerikaan David Horvitz daarin zeer geslaagd, de Italiaan Domingo Milella slaat met zijn antropologische kijk op landschappen de plank mis. Wat je aan het eind van zo’n goed gevulde dag nog gemist heb? 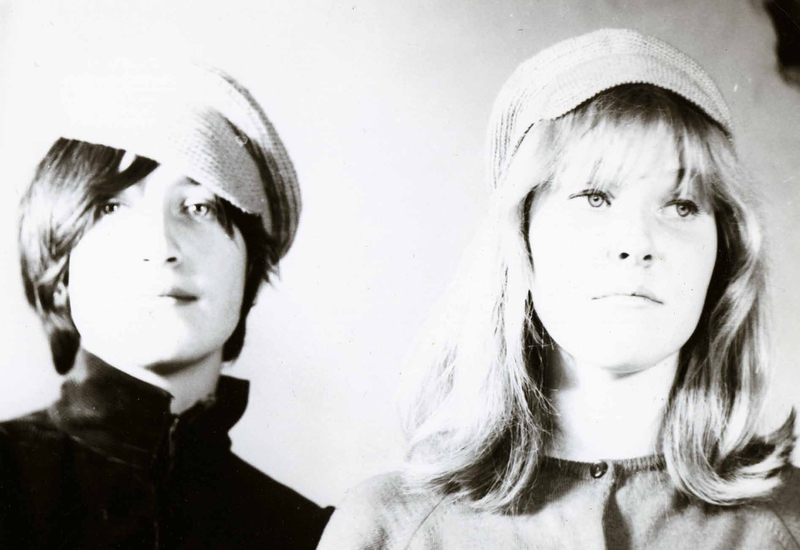 Een indrukwekkend retrospectief van het werk van de 90-jarige Franse fotograaf Chris Marker bijvoorbeeld, waarin te zien is waarom Parijs zijn grote inspiratiebron vormt. Maar in het Église des Trinitaires mag ook ‘The History of Monuments’ van de Chinese Wang Qingsong niet gemist worden. Al was het alleen al vanwege het feit dat het een foto van 42 meter in lengte betreft waarvoor tweehonderd mensen twee weken model gestaan hebben. Modelfotografie 2.0. Ook mag de aandacht die dit jaar uitgaat naar het New York Times Magazine niet vergeten worden. Op het festival wordt een mooi overzicht gegeven van de aandacht die het tijdschrift door de jaren heen aan fotografie heeft besteedt aan de hand van pagina’s uit het tijdschrift. Ook Erwin Olaf’s ‘Young Gay Rites’ maakt onderdeel uit van de serie. Naast de vele verschillende onderwerpen die zij hebben belicht wordt er ook uitleg gegeven over hun werkwijze (waaronder tijdens 9/11) en de keuzes die zij dag in dag uit moeten maken. Werken in de fotografie blijkt na het zien van de tentoonstelling(en) toch een stuk lastiger dan in eerste instantie gedacht. Beter goed gejat dan slecht bedacht, klinkt het welbekende spreekwoord. 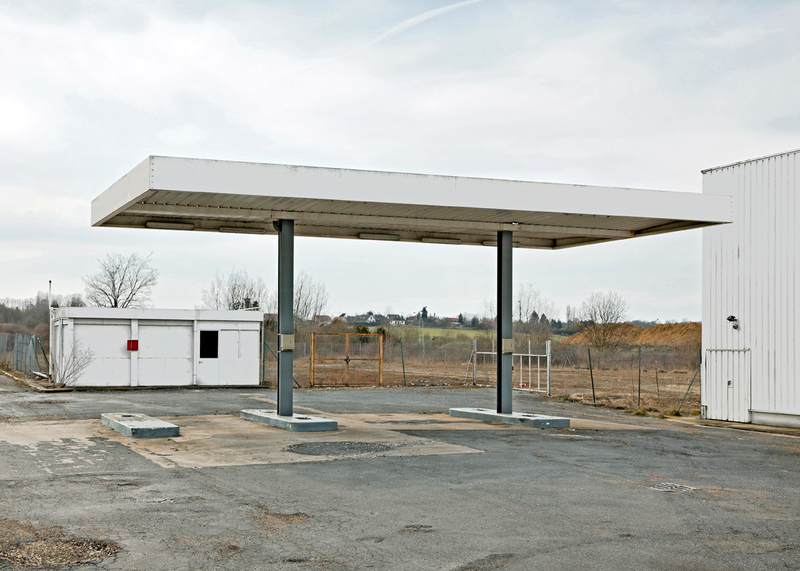 Dat gaat zeker op voor de ’26 abandoned gasoline station’-serie van Eric Tabuchi. Rechtstreeks afgekeken van Ed Ruscha, maar met een eigen stempel. En tekenend voor zijn overige werk. Ondanks zijn hang naar de Verenigde Staten, schiet hij al zijn foto’s binnen een 250 kilometer radius rond Parijs. 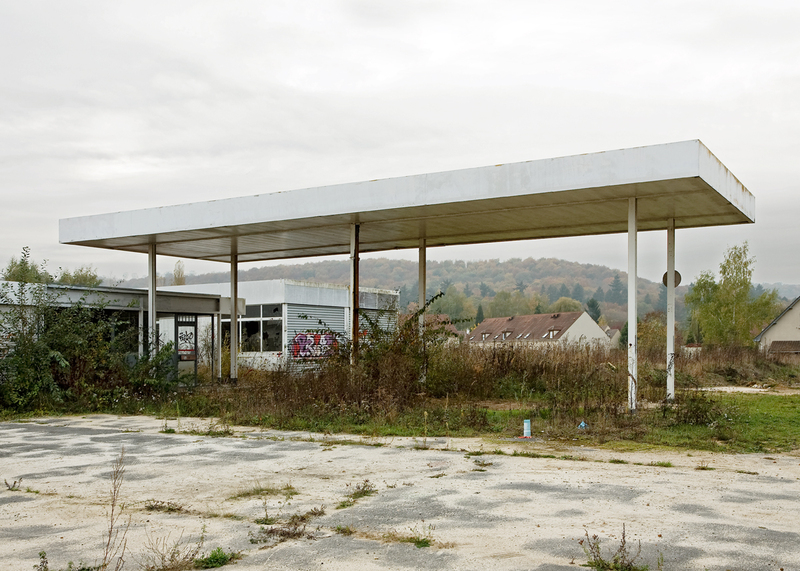 Voor Eric een gebied waar hij zo bekend mee is, dat hij de Franse route nationale op zijn foto’s kan doen voorkomen als een verlaten interstate. 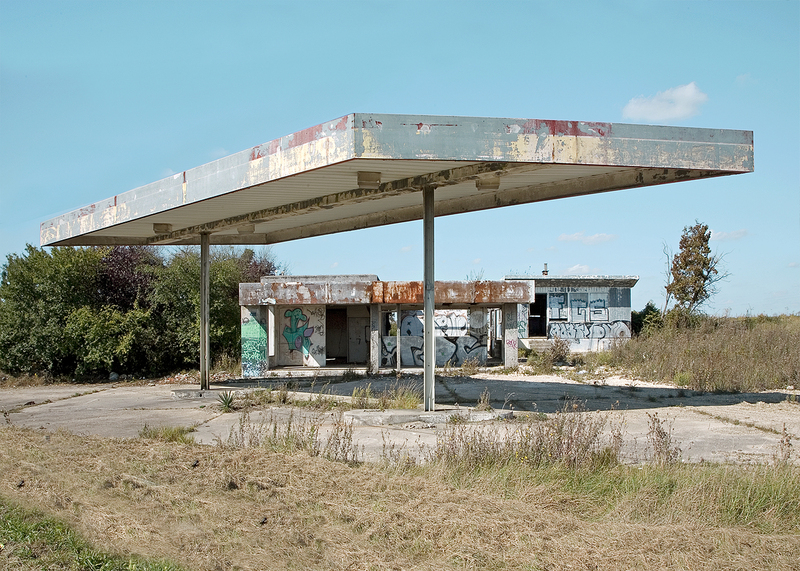 Zoals bijvoorbeeld voor zijn series ’26 abandoned gasstation’ en ‘Alphabet truck’. Beide gebaseerd op door anderen geproduceerde series. 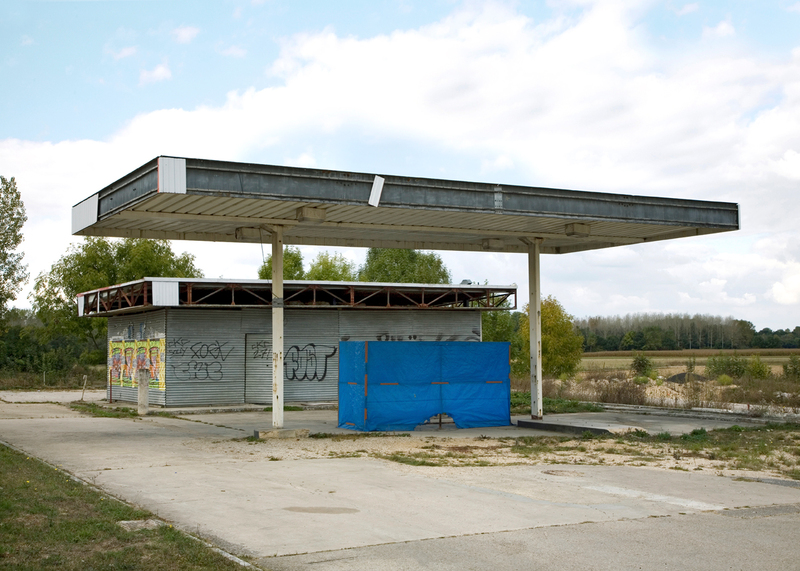 Met een compleet andere insteek en afwijkende achterliggende gedachte, stortte Eric zich van 2002 tot 2008 op een project vrijwel identiteit aan dat van Ed Ruscha. 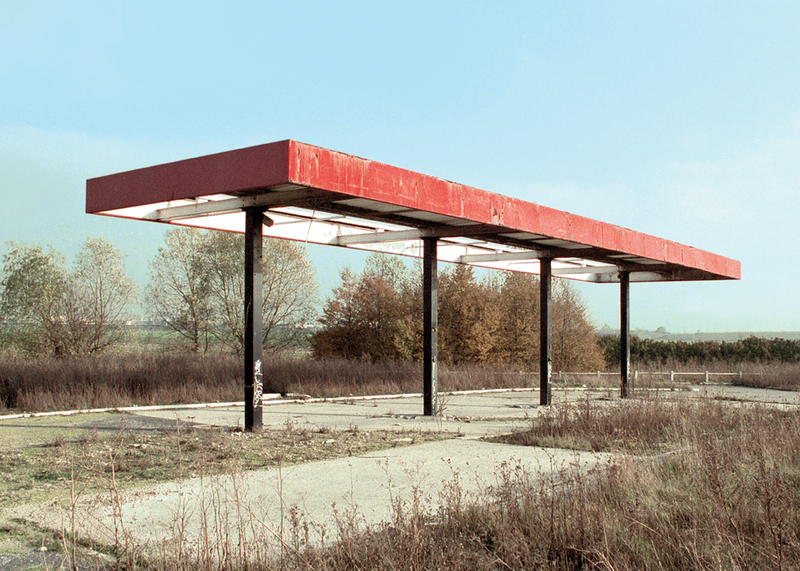 Begin jaren zestig fotografeerde hij namelijk 26 benzinestations, om in april 1963 zijn eerste fotoboek ‘Twentysix Gasoline Stations’ in eigen beheer uit te geven. Dit boek biedt precies wat de titel suggereert, net zo goed als dat bij het werk van Eric het geval is. 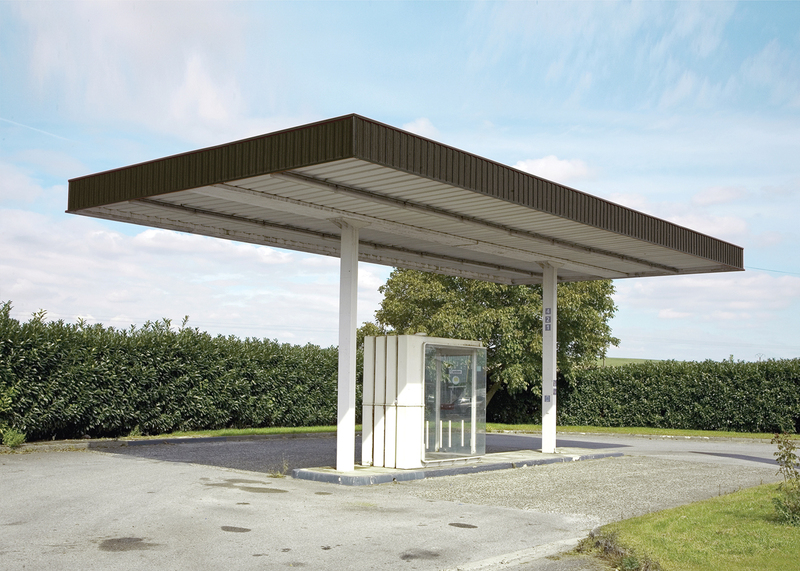 Ruscha reisde door de VS, Eric deed hetzelfde in Frankrijk. Saillant detail: beide boeken werden in een gelimiteerde oplage gepubliceerd en zijn nu gewilde verzamelobjecten. Toch kwam Eric niet pas op het idee na het zien van de foto’s van Ruscha. 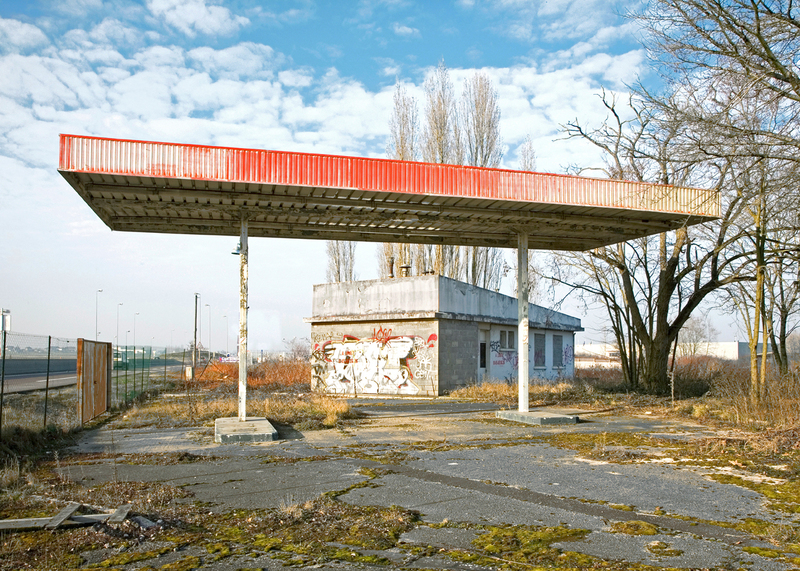 Hij fotografeerde immers al vele jaren verlaten benzinestations. ‘Vele zijn zowaar omgetoverd, soms tot bakkerij, kruidenierswinkel, restaurant en zelfs tot begrafenisonderneming. Deze ondernemingen, in tegenstellingen tot de grote oliemaatschappijen, onthullen een knutselwerk; een individueel initiatief. Ze illustreren perfect de zegswijze dat de natuur geen leegte verdraagt.’ Geen regulier jatwerk dus, niet eens een aanleiding. Net als zijn eerdere serie ‘Alphabet truck’ vormt andermans werk slechts een aanknopingspunt. Wie kent het alfabet-spel niet van lange autoritten? Het perfecte middel om totale verveling te voorkomen en voor een fotograaf als Eric een mooie aanleiding voor een serie: Alphabet truck. 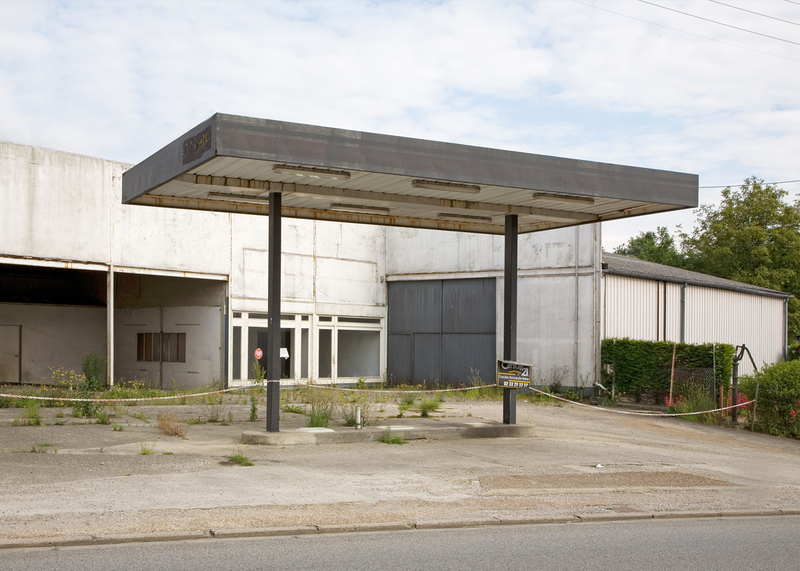 Net als ’26 abandoned gasstations’ speelt het zich af langs (of dit keer op) de Franse snelwegen en refereert het eveneens naar een eerdere publicatie van een kunstenaar. Nu zeggen de boeken The back of trucks passed while driving from Los Angeles to Santa Barbara van John Baldessari en Auchan, the letters of Claude Closky, ons wat minder dan een fotograaf als Ed Ruscha, maar de overeenkomsten zijn onmiskenbaar. Naast een fascinatie voor onstabiliteit, blijkt Eric ook uitermate geboeid te zijn door verlaten plekken. Als het even kan, lijkt het ook nog op een maanlandschap. ‘Soms heb ik zin om dat wat er lelijk uit kan zien mooi te maken. Dat is mijn manier om de gelaatsuitdrukking die men overdraagt op onze leefomgeving te veranderen.’ Hij maakt, op bijna ‘ondergrondse’ manier, een portret van een breekbare en wankele identiteit, zoals zijn eigen driedubbele. Een directe boodschap – ondanks de filosofische – heeft Eric niet met zijn series. ‘Ze laten gewoon dingen dien zonder een oordeel te vellen’, relativeert hij. Hij noemt zichzelf dan ook geen fotograaf, maar kunstenaar die met fotografie werkt. 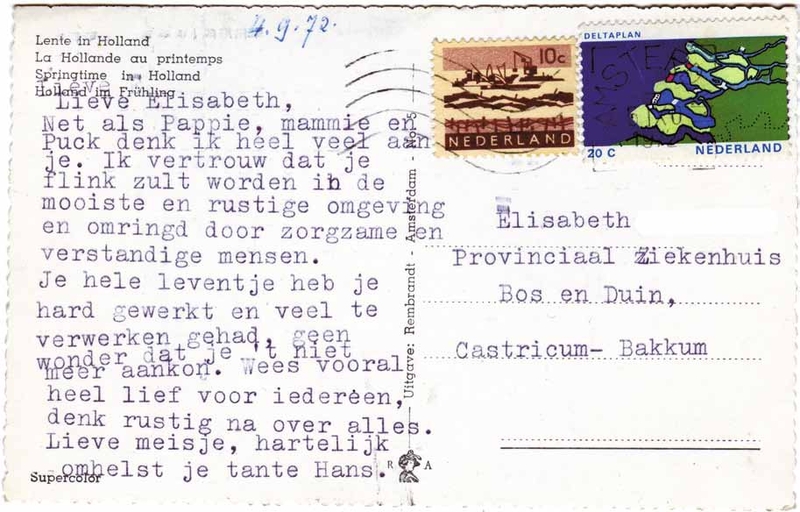 ‘Mijn werk hangt tussen nostalgie en nieuwsgierigheid, de foto’s laten een gebied zijn dat zich ontwikkelt, dat zich probeert aan te passen en dat nog niet is voltooid.’ En daarmee is het werk van Eric Tabuchi ook lang niet af. Over het algemeen vul je een fotoboek met je eigen foto’s. Logisch, maar niet voor Mariken Wessels. Zij maakt fotoboeken van andermans plaatjes; bewerkt vertelt ze er haar eigen verhaal mee. En wint ze ook nog eens prijzen. 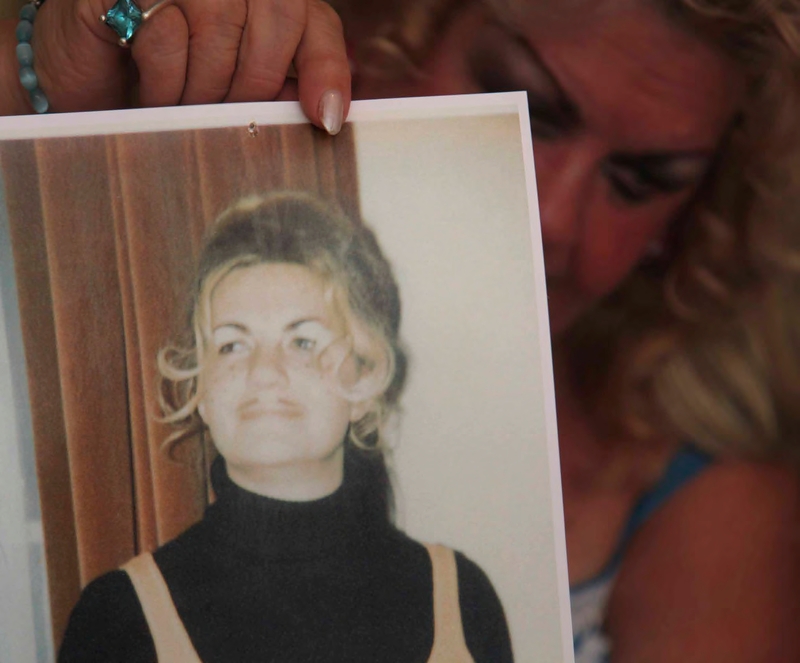 Mariken is daarom van mening dat ze zelf geen foto’s hoeft te maken om een verhaal te vertellen. Er zijn immers zoveel foto’s op de wereld die ze gewoon van de straat kan rapen, kan kopen op een rommelmarkt of haar cadeau worden gedaan. ‘Doe er maar wat mee’, zeggen ze als ze hun levensgeschiedenis achteloos aan mij geven. Dat grijpt mij wel aan en wil dan ook echt wat met dat materiaal doen. Er wat van maken. Op een Big Brother-achtige manier is dat heel intiem.’ Toch neemt Mariken altijd voldoende afstand en dienen de foto’s enkel als concept. Ze vertelt haar verhaal, niet dat van diegene op de foto. ‘Door dingen toe te voegen en weg te halen, verschuift het persoonlijke naar mijn kant’, legt Mariken uit. Ondanks dat Mariken fotoboeken maakt waarin het merendeel bestaat uit andermans beelden, meent zij toch dat het haar eigen werk is. Zo fotografeert ze zelf ook, herfotografeert ze de oude foto’s en ligt ze eruit wat interessant is voor haar verhaal. ‘Ik bedenk een personage, een verhaal en de wereld waarin het speelt. De oorspronkelijke persoon op de foto wordt niet realistische weergegeven; ik kende deze immers niet eens.’ Overeenkomsten zijn volgens Mariken dan ook toevallig; ze maakt geen documentaire. 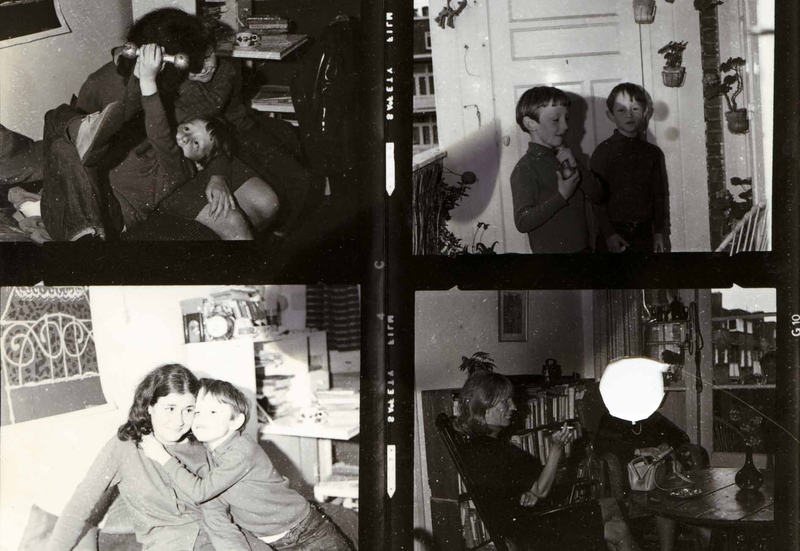 Mariken Wessels noemt zichzelf geen fotografe; daarvoor fotografeert ze te weinig. ‘Een kunstenares, in de breedste zin van het woord’, zo beschrijft ze zichzelf het liefst. ‘Fotoboeken worden namelijk op deze manier ook kunstobjecten. Hoewel fotografie een duidelijk aanwezige factor is, wil ik geen stempel drukken op mijn werk.’ Het succes heeft er in ieder geval voor gezorgd dat er alweer een nieuw boek op komst is. Mariken kan en wil nog geen tipje van de sluier oplichten, maar belooft eenzelfde werkwijze. ‘Het kan echter nog altijd een heel ander boek worden’, besluit ze grinnikend.